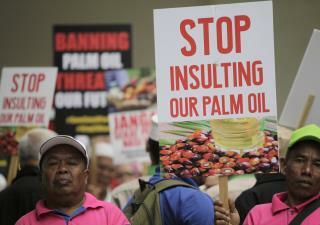 (Newser) – What does the $60 billion palm oil industry have in common with Big Tobacco? Lobbying tactics, says the World Health organization, namely attempts to influence research into the health effects of palm oil, Reuters reports. And as more countries move to ban trans fats, which make liquid oils solid at room temperature, palm oil is standing out “as an easy choice for ultra-processed foods.” According to the WHO study, labeling for palm oil in foods is often inconsistent (there are some 200 alternative names for the substance), and the healthfulness of the oil is up for debate. Also, the agency found that several studies purporting the health benefits of palm oil were authored by the Malaysian Palm Oil Board. does it make your hairy palms soft and silky? Those protesters signs look suspiciously well made, and are in English. My guess is they were made by the palm oil lobby and those field workers were handed those signs and told to protest in shifts. There's one good use for palm oil as its name would indicate.